Since the blog’s inception weighting has been the main comparative tool. Towards the back end of the 2015 season Expected Points (ExpPts) began to be used in the commentary. This is a very similar concept to Weighting, in that it is created using historical averages, but (hopefully) it is much more instinctively understood and one that the blog will be switching to in 2016. One omission from the above, amongst many! is the impact the defense was having on shooting returns. This changed with the Big Fish Little Fish piece where we observed big shifts in Conversion Rates depending on the opposition. This concept will now be introduced to ExpPts. This switch is relatively straightforward for everything bar goal attempts. In the 2015 Review we saw that 37% of point attempts were converted from Sector 4. In old parlance if you converted a shot from here your weighting was +0.63 and if you missed it was -0.37. The weighting was based on the Conversion Rate. The same principle applies for ExpPts. As 37% of all shots are converted a player is expected to score 0.37 points for every shot taken from here. If he converts that’s +0.63 ExpPts (1 – 0.37) or -0.37 if he misses. Do that across all the shot types in all the sectors and we have an ExpPts model. Goal attempts are slightly trickier. The weighting only ever had a value between 1 and -1 however on goal attempts we know there are three different returns; 3 points, 1 point or 0 points. There can be no direct correlation between goal shots and weighting. Instead we’ll create an ExpPts for goal shots. Over the past four years 531 goal attempts have been charted with a total of 192-50 scored. This haul equates to 1.18 points per attempt ((192*3)+50)/531). So the ExpPts for a goal attempt from play, without overlaying any factors, is 1.18. As ever this is a linear application. Not all goal shots are created equally (a pass across the square for an easy fisted goal is very different to a desperation shot with three defenders and a goalie in the way) but whilst shot location has been charted goalie & defender positions have not. Further sub division of goal attempts will be the main 2016 project. Deadballs are easier. All bar 38 (29 penalties & 9 attempts at goal from a free) of the 1,411 charted were point attempts so we have a direct correlation between weighting and ExpPts using the above methodology. For the record the ExpPts for a penalty is 2.48 (24 of 29 converted) and for an attempt at goal from a free is 0.33 (1 goal scored from 9 attempts). A nice example of how this works is the drawn Mayo-Dublin semi-final. Below is the ExpPts of both teams throughout the game. You can see how Mayo tracked their ExpPts throughout (i.e. 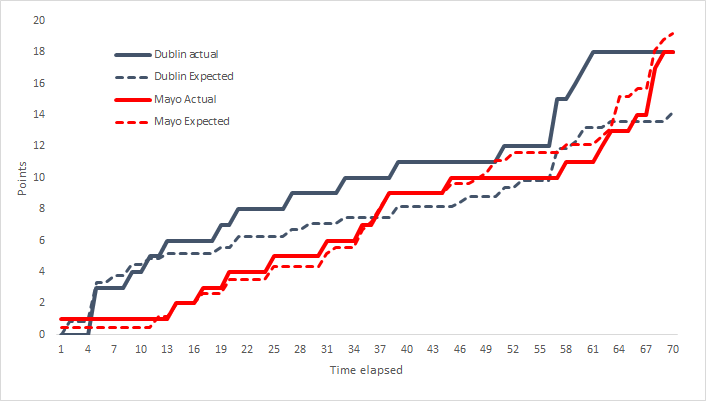 were basically getting what you expect from the shots attempted) but Dublin were nearly always ahead with the gap widening around the 55th minute. Here they scored 2 goals getting 6 points versus an expected return of 2.36. In the Big Fish Little Fish piece the argument was made that the non semi-finalists probably need to be further sub divided (into Div1 & Div2 v Div3 & Div4 perhaps) but we do run into sample size issues. We could also arbitrarily pick teams to be “Big Fish” (Dublin, Kerry, Mayo, Donegal definitely. Tyrone?). Again one to be reviewed with more data. So to wrap up we now have two Expected Points models; a bog standard one (ExptPts) based on pure averages – this is what was introduced within the two league semi-final reviews. The only difference with this metric from historic weightings is goal attempts with every goal shot having an ExpPts value of 1.18. We have also created a defensively adjusted Expected Points (will have to come up with some shorthand. I’m not writing that out every time!). Where this will really come to light is in the early round of the Championship when the player’s returns will be adjusted based on the quality of opposition.